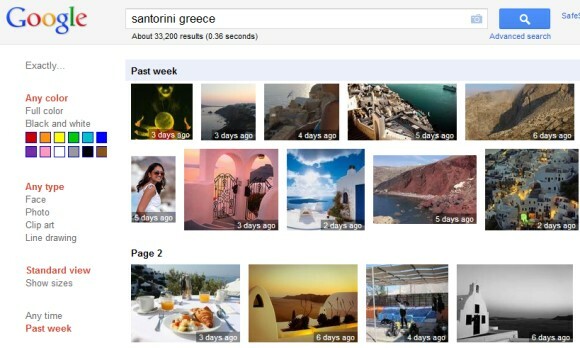 Google Image Search added a filter that lets you restrict the results to the pages created in the past week. Just click "past week" in the left sidebar and you'll see a list of recent images that include labels like "20 hours ago" or "5 days ago" to show how recent they are. Google's image search engine shows the same labels even if you don't restrict the results to recent images. The interface doesn't let you customize the date range, but you can edit the URL and replace "qdr:w" with "qdr:h" (past hour), "qdr:h20" (past 20 hours), "qdr:d" (past 24 hours), "qdr:d2" (past 2 days), "qdr:w2" (past 2 weeks), "qdr:m" (past month), "qdr:y" (past year). Another trick you can try is to type your query in Google Web Search, use the date filters from the sidebar and then click "Images" in the vertical menu. Custom date ranges don't work in Image Search yet. Here are some examples: Beijing photos from the past year, wedding photos from the past month, Android-related images from the past 2 weeks, Tour de France photos from the past week. It's important to keep in mind that the photos may not be so recent, but they're included in recent articles, blog posts and other Web pages. The nice thing about the "recent images" filter is that you can combine it with other advanced filters. You can sort the images by subject and restrict the results to recent images, find images that have a certain size or a predominant color and they were uploaded in the past year, find recent Creative Commons images or generate a list of recent images from a site (e.g. : cnn.com). Now we are familiar with all new Google updates.